The Best Pump Product On The Market! 400MG Of Caffeine Per Serving! The Best Pump Product On The Market! 400MG Of Caffeine Per Serving!The Best Pump Product On The Market! 400MG Of Caffeine Per Serving! 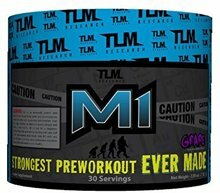 M1- Another preworkout claiming to be the strongest on the market. Some people may laugh, others may roll their eyes, others will doubt it. However, once you take one scoop, and one scoop only, you will see why it is the strongest pre workout on the market. Just about every product that makes this claim has 15,20,25+ ingredients in their proprietary blend. Sure, it looks great on the surface/label. What you aren't realizing is that in order for these ingredients to serve their intended purpose, you need to hit certain doses for each ingredient for them to actually be effective. That is where companies fail when they put claims on their products such as "The best pump product on the market" or "The strongest preworkout made". At TLM Research we are huge advocates of not throwing a bunch of ingredients together just for the sake of a better look. We want to put out products that work and products that back up what they claim on the labels. That is exactly what we did for Meth Lab, Blood Bath, Relentless, and now M1! With 400mg of caffeine per serving, and the 400mg of caffeinated being the weakest of all of the stimulants, you are in for quite the ride with M1. 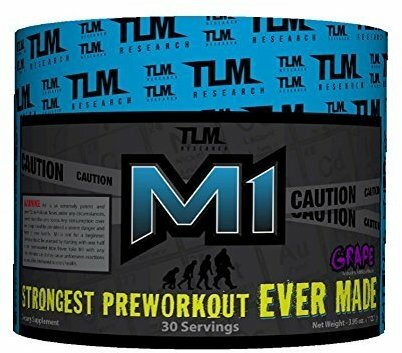 Caffeine, Higenamine,Dendrobium, Alpha Yohimbine, Snepherine, Hordenine, plus the Choline Bitartrate for focus, you will see why we can confidently say M1 is the strongest on the market. It comes in 2 delicious flavors: Grape and Bubble Gum. It is recommended to stack this with Blood Bath to get the optimal performance out of each training session. So strap in, buckle up, andhold on, because you are in for one heck of a rush with M1.